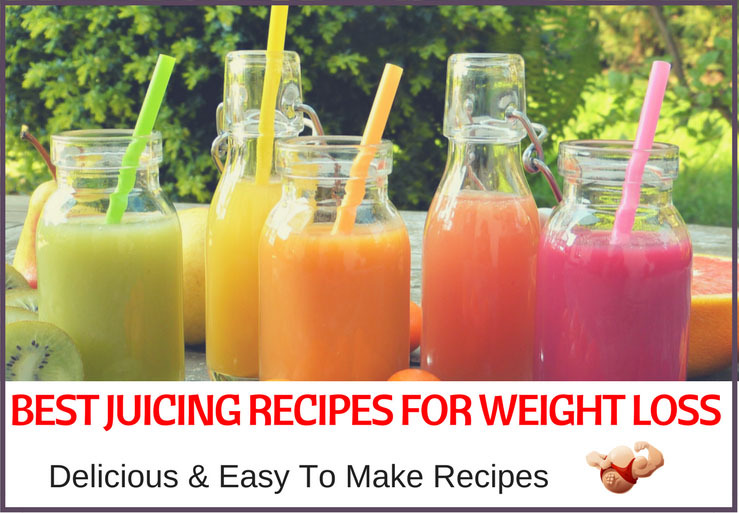 Best Juicing Recipes For Weight Loss - Do Juice Diets Work? Juicing is a tasty and quick way to give you body much needed vitamins, minerals and antioxidants. Because juices are so easy to make they can easily be incorporated into your diet and as a result of their easy and nutritious offerings; many people have used juicing as a way to lose weight. In theory – yes, of course, provided you very strictly adhere to a juice fasting plan. If we consider that all weight loss stems from consuming fewer calories than we burn off in a typical day, eschewing solid foods in favor of a juice diet should lead to an intake of less than a thousand calories per day, especially if you focus more on raw vegetables than fruits (remember all the sugar that is found in the latter! ), which is roughly half of what a healthy and active person is likely to expend. As is so often the case, however, the truth is a little more complex. Firstly, many people who switch to a juicing plan may find that they struggle with hunger and food cravings having experienced such a sudden plunge in calorie intake; there is always the risk that an individual on a liquid diet will find themselves snacking on solid foods for an energy fix, which could negate the weight loss of the juicing – especially if the snack food of choice is high in sugar or carbohydrates. The fact that most juicing diets are also low in protein lead to a reduced muscle mass1, which in turn will have an impact on the way your body processes the intake of calories. If your body senses that it may be entering starvation mode, it will start to slow down the rate at which is burns calories in an act of self-preservation2. We also need to remember that this only lasts as long as the juice fast – any pounds shed on during this liquid diet plan will probably be quickly regained the moment you switch back to conventional meals, so juice fasting is not sustainable as a long-term option. If you intend to take this route, assign yourself a target weight, stick to the plan, and move onto a more conventional balanced diet and exercise schedule upon completion of the fast. Juicing can most certainly help you lose weight in the short-term, especially if you pack your juicer with green vegetables, and in many respects it’s the fastest way of doing so; this diet is the perfect solution if you are looking to drop a waist measurement for a particular occasion or medical procedure, for example. You will have to be very disciplined, however, and should definitely ensure that juicing fits into your lifestyle before embarking on this particular diet plan. While the idea of a juice fast should be approached carefully and treated with some consideration, there are undoubtedly benefits to embarking on such a diet plan – after all, why else would anybody do it? The main health benefit that stems from embarking on a juice fast to aid weight loss is detoxification. It’s no secret that green vegetables are packed with essential goodness for your body, and we have previously established, you should aim to load your juicer with as many of these ingredients as possible; fruit is best kept in reserve as a tasty treat for dessert or otherwise used sparingly. The use of superfoods such as kale and spinach in your juicer will benefit your skin, hair and nails, as well as promoting a healthy heart and lowering cholesterol, and will improve your body’s levels of insulin resistance. Fiber is something of a hot potato in the world of juicing – or rather, the lack thereof. Most juicers tend to break down their ingredients to the point where fiber is removed, which is a double-edged sword. On the plus side, a lack of fiber makes juices easier for the body to digest as there is nothing to process, meaning that you will not feel bloated while the nutrients speed their way through your bloodstream. On the other, fiber is hugely important as part of a healthy, balanced diet. Arguably the best of both worlds is to pick up a blender in addition to your juicer (sorry to add to your expenses), as these gadgets will typically allow you to select to retain pulp from your ingredients. Doing so will create a smoothie; a thicker alternative to juice that moves slower through your system, but retains all the dense nutrients of your ingredients. Mixing and matching, with a bias toward juicing for weight loss, should help ensure that you are not missing out on fiber – and very occasionally, you can even include pulses of beans for a protein fix. 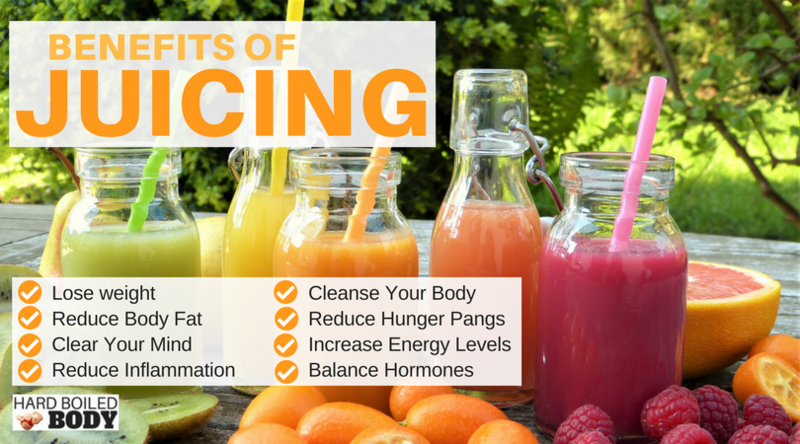 Some of the more expensive juicers have extra programs that allow you to work out the maximum benefits from juicing certain selections of ingredients, but we are talking a four-figure outlay. Juicing is also increasingly popular, which means that this particular eating plan has a sizable community of advocates online and off. This means that you will not struggle to support and encouragement to stay on plan, or find healthy and interesting recipe suggestions, more and more of which crop up each and every day. Thankfully the lack of restriction afforded juicing means that there will never be a shortage of ingredient combinations that you can experiment with. Of course, perhaps the biggest plus of juicing for weight loss is that at least this is not a fad diet. Juicing may not be an ideal long-term solution as you will eventually need to switch back to solids in order to obtain the correct balance of major food groups and nutrients, but it’s certainly less damaging to your body than some of the most bizarre and grotesque eating plans promoted by supposed gurus of questionable standing. Much of what we have discussed so far relates to juice fasting, and a complete rejection of solid foods during the length of the meal plan. How does casual juicing play into this, perhaps as part of a sporadic fast such as the popular 5:2 diet? Will you still manage to obtain any health benefits from this, or are you placing yourself at unnecessary risk? Casual juicing may actually be the ideal starting point before embarking on a juice fast, even if you carefully begin your juicing journey by adding a glass to a standard day’s meal plan (be careful, though – if you intend on using this for weight loss, you’ll achieve little by piling excess calories on top of what you are already eating). It can also be a useful way of ensuring you get some fresh vegetables into your diet if that isn’t something that comes naturally to you. You may find it beneficial to switch out one meal a day for a juice-based replacement; breakfast is ideal, as you will be feeding these nutrients to an empty stomach and thus gaining the most from them. As a longer-term plan, casual juicing is significantly safer than a full-time juice fast. We previously touched upon the impact that a lack of protein can have on the human body, and if you balance a healthy diet with casual juicing you will still be able to obtain what you need – and you are less likely to fall off the wagon by not regularly depriving yourself of solid food. Casual juicing can also aid as a weight loss plan if you’re prepared to be patient; if you fast in very small, sporadic periods as opposed to constantly your body is less likely to go into shock and thus react as though starved, and you will continue to burn calories as a healthy standard rate as opposed to the slowed metabolism that you will experience from fasting. Replacing one meal a day with a juice (there are a plethora of superfood ingredients that specialize in fat burning, in addition to providing a host of other health benefits) is arguably the safest and most efficient way of bringing a liquid diet into your life to add weight loss, and is advisable over fad diets such as the 5:2 – which could lead to a great deal of later complications in your body and mind3. It will obviously take a little longer to shed those pounds than a juice fast would, and it’s not an invitation to load up on complex carb-laden junk food for your remaining intake, but it is a sensible and manageable way of counting calories without depriving your body of the essential minerals and nutrients required to function optimally. The cornerstone of any juice-centric diet should be green vegetables – if your glass is a fetching shade of jade, you’re on the right track. 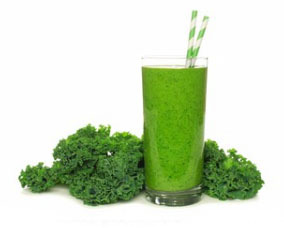 Ingredients such as spinach, celery and kale are superfoods, meaning that they are absolutely loaded with antioxidants as well being extremely low in fat and calories – and in many cases can act as a protein source, which will reduce the risk of muscle degradation throughout the course of a juice fast. Most of all, however, green vegetables will help fill your stomach, leaving you less likely to cave in and gorge on unhealthy solid snacks, as well as aiding your digestion. You may not get to enjoy the fiber contained within these veggies – a necessary evil of juicing – but instead of slowing your metabolism, the presence of these ingredients will keep your internal organs working hard without exhausting your body. Surely we already covered cucumbers under the banner of green vegetables, right? Well yes, but there is more to these tubes of goodness than meets the eye. Like the green veg discussed above, cucumbers are loaded with minerals and vitamins without piling on the calories, but they also add a delicious refreshing taste to your juice. The water contained within cucumbers will also keep your hydrated throughout your day – somewhat important when you are drinking your meals instead of consuming solids – and this H2O provides a constant kick-start to any spluttering metabolism. Beetroot may not always be appealing to most palates, but it’s a fantastic addition to any liquid fasting/detox/weight loss plan. Contained within these superfood vegetables is the antioxidant beta cyanin, which actively attacks and removes fatty deposits from your bloodstream – making this ingredient equally good for your heart and your waistline! 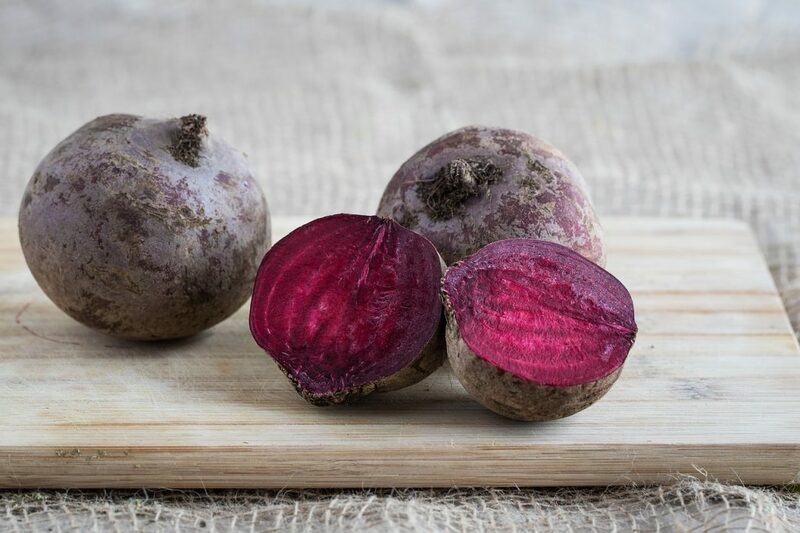 Beetroot is low on the glycemic index too, which ensures that it releases energy very slowly – all the bursts and pleasures of filling your body with sugary foods that give that instant high, but none of the unpleasant crashes that invariably follow such a meal. 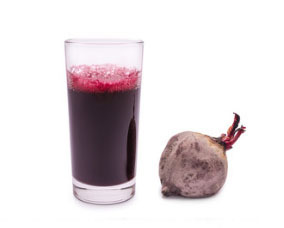 Adding beetroot to your juicing plans is a sure-fire way of keeping yourself active and alert throughout a day without needing to consume excessive calories to do so. 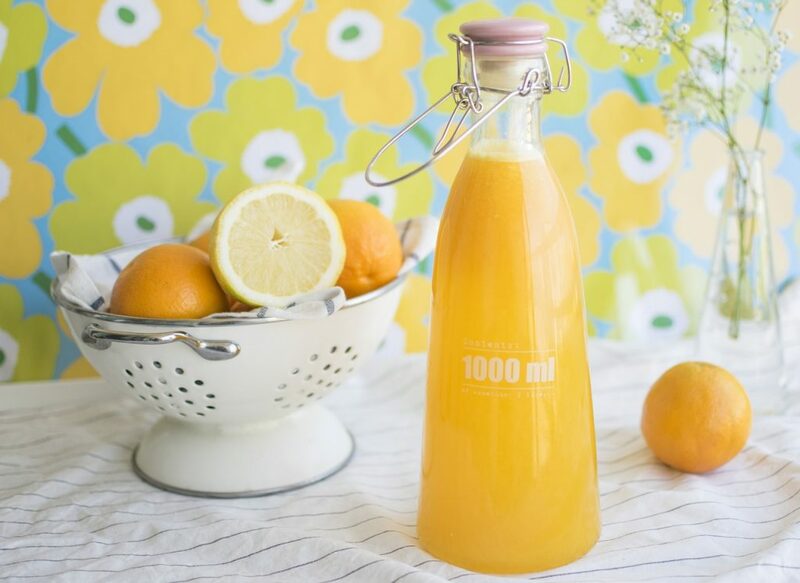 Grapefruit is such a popular food for fat-burning that it has its own fad diet (unimaginatively described as The Grapefruit Diet), and while we would never condone risking your health with such an exercise, it is definitely a worthwhile ingredient for any juice fast once you have adapted to the sharp, sour taste. 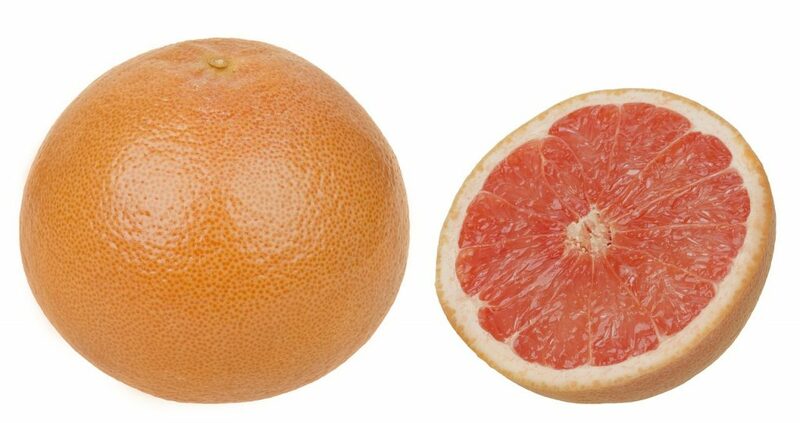 The science behind the Grapefruit Diet is the presence of the AMP-activated protein kinase (AMPK) enzyme in the ingredient, which speeds up the metabolism and encourages the body to burn off any storages of fat for a slow and steady release of energy – hence why grapefruit juice is such a popular choice at breakfast for many health-conscious individuals. Filled with Vitamin C and other antioxidants, there are few reasons not to include grapefruit in your juice diet. 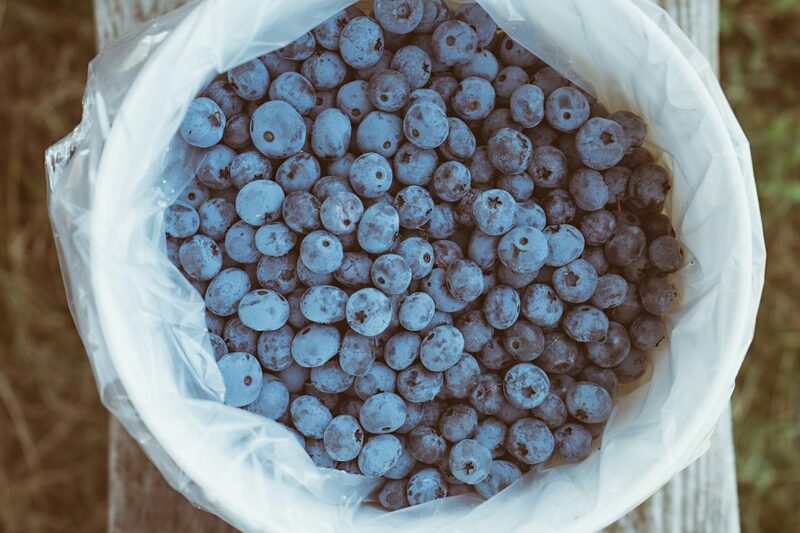 Blueberries are some of the most highly regarded superfoods available, with more benefits to the body and mind that one could shake a stick at – the skin, hair, internal organs, brain and bones all benefit from munching on a carton of these tasty treats. Tossing them into your juicer is also a surefire way of dropping unwanted pounds, as these have been shown to actively burn away fat cells, while continuing to slowly and steadily release energy – if you are on a three meal a day juice fast, add some blueberries to your breakfast to feel the benefit all day long. It’s hard to imagine something so delicious being so healthy, and yet, there we are. Just a reminder – never attempt a fasting or detox juicing diet if you have other health complications, without consulting your medical practitioner or dietician/nutritionist. The recipes shown, whilst delicious, are for guidelines only and on the assumption that the recipient is in good health, other than wanting to drop a few pounds or more. The first thing you need to consider is what juicer to buy and what suits your needs and of course, your budget. There are three main different types of juicers – centrifugal, masticating and triturating. Scared of these big words – don’t be, the juicers are all easy to use, they just operate differently. Choosing your juicer very much depends on your lifestyle – if you are short of time, you need one that acts fast. These are usually the centrifugal juicers, and they also tend to be more economical and available in compact sizes. A masticating juicer tends to get the best and most nutrients out of the products you place in it, and is particularly beneficial to use if you want to juice grasses as well. A triturating juicer is also a bonus buy if you are really serious about getting the best nutrition from your juice – First, it crushes fruits and vegetables before squeezing out every available ounce of juice. This way all beneficial fiber, vitamins, minerals and enzymes are released and retained in the final juice. If you are prepared to spend a little more and like or need to make juice in bulk, choose a juicer that has up to date technology. These more expensive models have an oxidation process installed, which means you can store juice for longer. It is worth thinking about. So now you have picked your favorite juicer model, here are the best tips to follow. Choose your fruit carefully and where possible buy organic. Any pesticides on the outside of the skin will be transferred to your juice, as will any bacteria, so also make sure you wash all produce thoroughly before using. Whilst you can juice some product whole, generally speaking it is better to cut into pieces, or in the case of leafy greens, tear them roughly to fit into your machine. Try to make time to prepare your ingredients the night before, as you may not feel like rushing around in the morning unless you are up and bright as a button. Assemble your juicer ready to go the night before, and if you have a machine with a pulp basket, it is quite convenient to line it with a plastic food bag or similar so that washing is limited and easier! If you are using soft fruits or vegetables, and you have a two speed juicer, make sure you use the lower speed, but if in doubt, follow the manufacturer’s instructions. It is more than likely that it will show to juice hard vegetables on high speed and the softer ones, such as berries, on the low speed. Always check the pulp after juicing – if it still has life and looks a little ‘liquidy’, put it back through the machine and squeeze out the last drops – sometimes you will get quite a lot even after the first juicing. Whilst you can more or less juice everything the same way, there are some exceptions to getting the best out of your fruit and vegetables. Beets – Always peel off skin – it is too earthy. Cut to fit juicer. Cruciferous Vegetables such as broccoli, juice everything – very nutritious particularly the stalks. Greens & Red Cabbage – Must be firm and crisp. Cut into quarters or smaller before juicing. 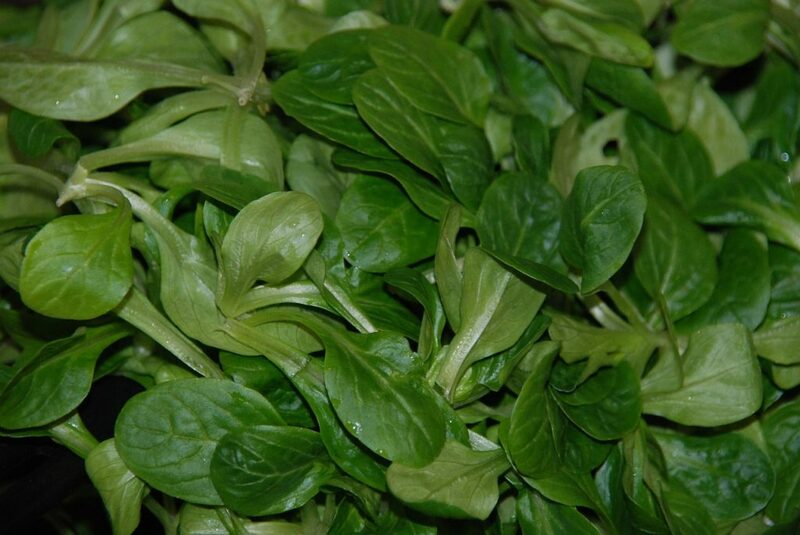 Soft leafy green items such as lettuce where the leaves are softer – make sure you thoroughly clean. Roll up the leaves for ease. Put through the juicer before harder fruit or veg. Carrots: Make sure clean, but then you can use all of it, including carrot tops or green shoots. Celery – Rinse and just put the whole stems through the juicer, including leaves. Cucumber – Best cut in half – you can also use it to push other soft items through the juicer. Citrus Fruits, Lemons, Limes, Oranges & Grapefuit – Peel off skin but keep some of the white pith intact (contains vitamin C and antioxidants). Most people remove pips but you can leave them in, as they are quite nutritious. However, if your juicer is not very powerful, whole pips may remain which can cause broken teeth. Grapes – Wash and remove from stems. Add to juicer.Kiwi – Easy – just peel and throw into the juicer. Mango – Peel and cut away flesh from the hard inner stone. Makes the juicer thicker and more like a smoothie! Melons – All melons should have skin removed and cut into wedges. You can leave seeds in if desired. Pineapple – Peel the skin, remove top and cut out any very ‘woody’ bits inside. This is just a selection of healthy fruit and vegetable for juicing. If you want to add herbs, you can remove the leaves from the stems or, if the herb isn’t woody, such as rosemary, juice the whole lot! It is pretty obvious that drinking the juice fresh out of the machine will provide more nutrients, as juice will deteriorate over a period of time. Always store in airtight containers filled right to the top for maximum benefit and to prevent oxidization. You can freeze juice and if that is what you want to do, do it immediately you have finished juicing the batch. However, it is far better to store in the fridge and drink up within 2 days, than to freeze it. Never leave in sunlight or hot conditions, try to keep the juice cool at all times. Fresh juice obviously has no preservatives, unlike supermarket purchased ones. Ensure you keep your juicer scrupulously clean. Most juicers are best washed or gently scrubbed to remove all traces of stuck on fruit or vegetables – usually warm soapy water will suffice, but do read your manufacturers’ instruction manual if your machine is dishwasher safe. Never immerse the bottom unit with the plug in water. Whilst fresh juices are delicious, they are not a substitute for whole produce. However, you may find certain fruit and vegetables not to your liking but you know they are good for you. You can ‘sneak’ these into any juice to get nutritional value, whilst not have to chew down on them on a normal plate of food. To avoid any form of settlement, always shake or stir your juice before consumption – and if you want it really cold on a hot day, you can add ice during the juicing process or after. This is one of the prime juices for weight loss, and particularly to feel satiated and not wanting to snack. It is useful to have in between meals and pretty tasty too. With plenty of vitamins and minerals, as well as antioxidant properties, this is a very healthy juice with a touch of sweetness. Wash all produce well to remove any dirt or grit. Put the ingredients through juicer and enjoy! Raspberries are considered the best fruits for juicing weight loss. Full of antioxidants and with xylitol as a natural sweetener contained in the raspberries, it makes this drink very healthy and quite low in calories. It is also a rich source of vitamins A, C and E. Watermelon, as well as being thirst-quenching, is 92% water, which gives you a ‘fuller feeling’ and prevents hunger pangs, and diving into more snacks! Simply multiply the quantities if you are making for more dieters, or purely for health! Make up a cup of green tea, just as you would normally. You need around 11fl.oz of water, boiled. Add the green tea bags to it and let them steep for 3-4 minutes, squeeze them out then throw away. Allow to cool. 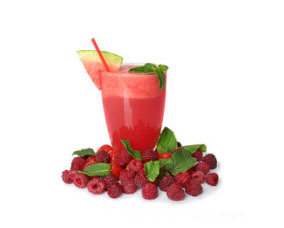 Add the raspberries, watermelon and green tea to your juicer, along with some ice if desired. Blitz until desired consistency is reached. You can put it in the fridge for 2 days if you don’t want to drink it immediately, or want to take it to work or in the car. 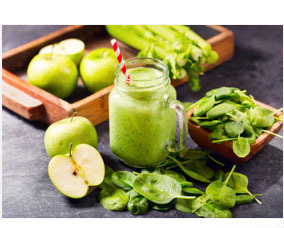 Apple and mint are always a great combination, and added to spinach and a selection of other greens, will keep you healthy and aid weight loss. A touch of lime gives it a zesty after taste and will certainly liven you up if drank first thing in the morning – a kick starter to your system! For a longer drink, add ¼ cup of coconut water to really bring out the taste of all the fruit and vegetables. 3-4 sprigs of mint, leaves removed from stems. 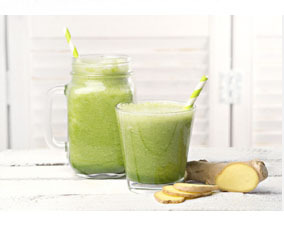 Put ingredients through juicer — begin with the apple, then all the greens, and finally the zucchini or cucumber and lime. Mix through coconut water thoroughly by shaking cocktail style in a container, or stirring vigorously. Purple or blue fruits and vegetables contain a natural pigment which is full of flavonoids of which one is resveratrol, a known aid in keeping your immunity system at full power and controlling blood pressure levels. A selection of these colored fruits as part of your diet will help you lose weight and you will be less likely to gain weight or become overweight. This juice is an amazing color, and you really want to drink it! If you never eat beets, this recipe will convert you and make them easier to digest. Prepare the vegetables by cleaning or peeling, and chop before placing in juicer. (The grapes are fine, but the others benefit from being cut up). There is no specific order to place the ingredients into your juicer, just drink up and enjoy. This is a great juice for cleansing or a detox and will also soothe an upset stomach or ease any ‘feeling sick’ symptoms. It’s warming and soothing as well as an aid to weight loss. If ginger is a little too pungent for you, substitute with turmeric root, it has the same calming effect on your system. Easy to juice. Just place all the ingredients in your juicer and let it work its magic! Looking for a fast way to lose weight? Check out our blog on The 2 Week Diet!